Hope your having a great Thursday. Today, I start my 7 day stint at dog and kitty sitting. Only problem is, I have to go to their house several times a day to feed and spend time with them. Their dog doesn't get along with other dogs (Keeley, the blog dog would faint anyway!) and our dog doesn't know about kitties. Thankfully I only have to drive about two miles............And, they are always so excited to see Grandma!! 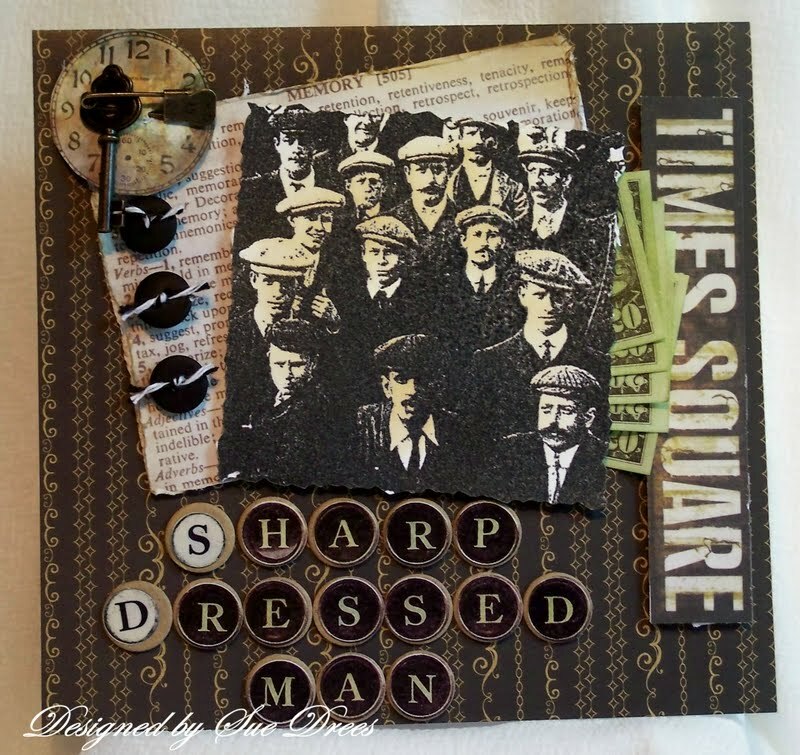 Today's card is for the challenge at Gingersnap Creations, GCSP08, Blue Moon Challenge. The challenge is to use the monthly theme, A trip to the mall, and a recipe, three papers, three buttons, and three words. 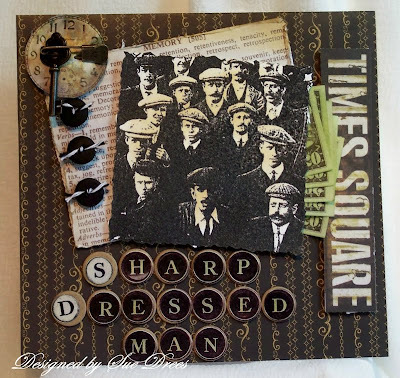 I'm also entering this card in the challenge at Simon Says Stamp and Show. The challenge this week is to use a word on your card. Words - Stickers mounted on cardboard circles. Child's play money sponged with green dye ink. Fabulous vintage card. They really were smart dressers, weren't they? Wow I love this think you nailed both challenges and just love your sharp dressed man. Good luck with the animal sitting. Completely fabulous! I love it! WOW Sue this card is Brilliant, great use of a word! The vintage elements are fabulous! Thanks for joining us at Simon Says Stamp and Show Challenge! I love your card...such great vintage feel and detail. It would even look wonderful in a frame! What a totally fabulous card--WOW!! !